As we develop and put in place ever more sophisticated talent management tools and systems, featuring increasingly granular tracking systems and flashy, multi-color dashboards, do you ever wonder if we’re overthinking the measurement thing? If you do, you’ll enjoy this. Alexander Kjerulf, who blogs as the Chief Happiness Officer, tells us about the groundbreaking technology which British social media agency Nixon McInnes put in place a while back to measure happiness in the workplace. It consists of … wait for it … a couple of buckets and a few dozen tennis balls. 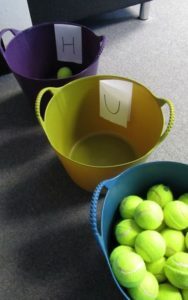 Every day as employees leave work they drop a ball into either the “Happy” or “Unhappy” basket. The balls are counted and the daily and weekly results are displayed on a monitor in the office. Yup – that’s all it takes. It’s simple, so it actually gets done and it’s almost real-time because it presents daily data. An additional benefit is that it gives employees a chance to reflect every day on their happiness at work, which is also a good practice. Kudos! So there you have it: A measurement system with real balls. Don’t misunderstand me: I’m not advocating that we ditch talent management technology. There are some incredible tools out there and organizations are doing amazing things with them. I’m simply suggesting we keep our mind open to the possibility of the simple and elegant low tech solution.